This little printed booklet listing all the best regular pagan events taking place in London during 2018 is so delightfully old-school - and it is free! Esoteric London, which was put together by Hendon Heathens, is described as: "A small guide to some of the public meetings, events and shops in the primary occult city in Europe." It lists the dates for meetings and open rituals held by major pagan, heathen and druid groups in London for the year ahead. These include the Pagan Federation London, Nova Stellar, the Loose Association of Druids, Children of Artemis, London Fortean Society, Dawn of the Oak, South East London Folklore Society, Kith of the Tree and the Well, Hendon Heathens, Pagan Futurefests, Deptford Jack-in-the-Green and London Pagan Pride. 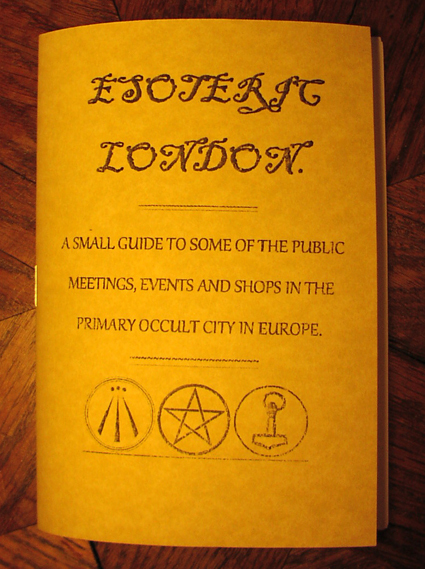 The booklet also mentions Central London's best occult bookshops - Treadwell's, Atlantis and Watkins. I'm also rather chuffed that my own blog gets a mention at the end. It says: "Also check out A Bad Witch's Blog at www.badwitch.co.uk who does a weekly events list of just about every esoteric meeting going on in London. Highly recommended!" I have a big smile on my face over that! I was given my copy at Treadwell's bookshop yesterday and there was a pile of them by the front counter. They are free to take, so do pop in and pick up a copy if you are in the area soon as I suspect the booklets will all go quickly and probably end up being collectors' items.